Sumer Hughes, at center, was recently recognized at the commission meeting for her success at registering 33 of her fellow classmates to vote at Hannan. Pictured with Hughes, from left, are Brittany Westfall, director of elections at the Secretary of State’s office, Dave Gilpin, West Virginia Secretary of State field representative, County Clerk Diana Cromley, Commissioners Rick Handley, Sam Nibert, Tracy Doolittle. 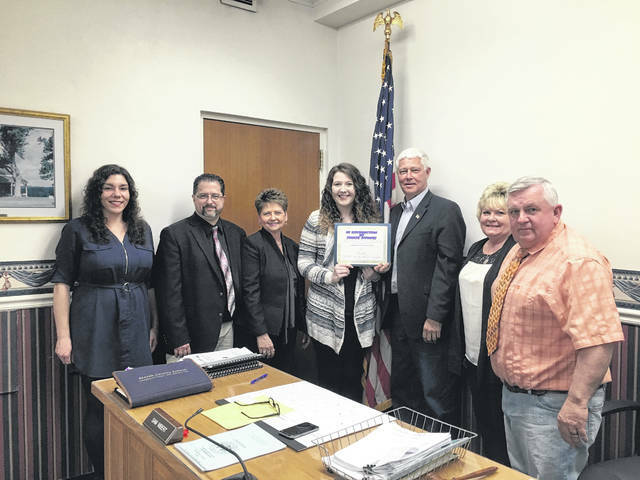 POINT PLEASANT — The Mason County Commission recently met, recognizing a local student for her accomplishment of registering 33 of her fellow classmates for voting this school year. Cromley congratulated Sumer Hughes, senior at Hannan Junior/Senior High School, for taking the initiative and successfully registering 33 of her fellow classmates to vote. Cromley said she is “very pleased” as she understands how difficult it can be to get such a high number of individuals registered to vote especially in a high school setting. Handley then presented a certificate to Hughes naming her an honorary Secretary of State for Mason County. In other business, the commissioners approved to move Ashley Wervey to a full time position and to hire Jessica Dalton and Elisabeth Lloyd on an as needed basis for telecommunications at the Mason County Office of Emergency Services. Dennis Zimmerman, emergency manager/director of Mason County Office of Emergency Services, discussed the Mason County EMS budget with the commission, one of the budget reports reflected capital improvements for the department. The commissioners approved to allow the Mason County EMS to move forward with its project for an upgraded Computer Aided Dispatch (CAD) machine. Jon Blaine, owner/operator at Blaine Surveying/ Appalachian Development Authority, discussed the idea of potentially utilizing microgridding in Mason County. The commissioners will be setting up a meeting with Blaine to discuss this further. The commissioners approved the 2019-20 budget set at $7,360,401. The commissioners approved to have Handley sign for the approval of a Community Corrections grant for the Mason County Day Report Center. Doolittle commented though Mason County did not appear on the list released by the West Virginia Division of Highways for quick attention to work on secondary roads in the county, the commissioners did turn in the appropriate paperwork and on time to the Division of Highways department. https://www.mydailyregister.com/wp-content/uploads/sites/24/2019/04/web1_HughesRecognized.jpgSumer Hughes, at center, was recently recognized at the commission meeting for her success at registering 33 of her fellow classmates to vote at Hannan. Pictured with Hughes, from left, are Brittany Westfall, director of elections at the Secretary of State’s office, Dave Gilpin, West Virginia Secretary of State field representative, County Clerk Diana Cromley, Commissioners Rick Handley, Sam Nibert, Tracy Doolittle.